Go mining for a potential jackpot or 2 in Dwarf Mine, a superbly designed 5 reel video slot from Yggdrasil Gaming. The game come with expanding reels that can offer up to 16,807 ways to win. There are also 2 free spins rounds. Play on your PC, tablet or mobile from between 10p and £125 per spin. As you might expect given the title, the action here takes place in a mine. The standard 5×4 reels offer 1,024 ways to win. These can expand though, more of which shortly. On those reels you’ll see playing card suit symbols plus a selection of mining related imagery. In order of value are shovels, lamps, pick axes and helmets. The latter is the best of the standard symbols, paying 1.4 times your bet if you land 5 on adjacent reels. Every time a Bonus symbol lands it expands the reels by 1 row, up to a maximum of 7 rows in the Expanding Reels feature. The more rows active, the larger the number of ways to win. At their maximum they can offer 16,807 opportunities. When the reels are expanded, 4 extra symbols are in play. These jewels don’t offer any payouts but whenever they hit, they are collected in a meter to the left of the reels. Once you have got 5 of a specific jewel, you’ll activate 1 of the game’s 2 free spin rounds. Collection Free Spins feature – 5 free spins on the fully expanded 5×7 reels are awarded here. Also joining the mix is a Super High Pay symbol. Which one is added depends on the gemstone collected to trigger the feature. The most rewarding is the red triangle which offers 4 times your bet for 5 in combination. Free Spins feature – land 3 Bonus symbols on the same spin and you’ll receive 10 free spins. Once again, they’re played on the full-sized reels which deliver 16,807 ways to land a winner. The Super High Pay symbols aren’t in play here though. Yggdrasil Gaming are one of the online casino world’s top developers when it comes to design and Dwarf Mine is another cracker on that score. The visuals are excellent, the animation silky smooth and the backing track suitably stirring. The gameplay is a little unusual for an Yggdrasil Gaming video slot. There isn’t a massive range of extras here but the expanding reels and free spins deliver enough action to keep things ticking over. Shape shifting reels are extremely popular at the moment. It’s not as explosive as some similarly themed games but the classy design and extra makes Dwarf Mine worth a closer look. It can reward you with 3,904.2 times your bet on each free spin though! 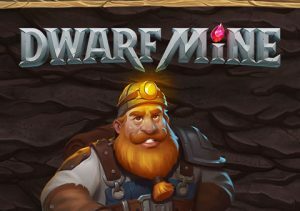 If mining dwarves are your thing, Quickspin’s Dwarfs Gone Wild should be played – I also suggest Diamond Mine MegaWays from Blueprint Gaming if you want to go digging for big wins.